Get a sense of the local culture at Sea Fortress Suomenlinna and Rock Church. Get some historical perspective at Helsinki Cathedral and Seurasaari Island and Open-Air Museum. 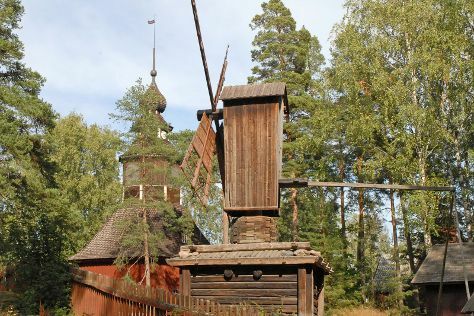 Change things up with these side-trips from Helsinki: Langinkoski Imperial Fishing Lodge Museum (in Kotka), Visavuori (in Valkeakoski) and Parola Tank Museum (in Parola). There's still lots to do: contemplate in the serene atmosphere at Uspenskin Cathedral (Uspenskin Katedraali), admire the masterpieces at Forssa Museum, pause for some serene contemplation at Pyhtaa Church of Saint Henry, and steep yourself in history at Mannerheim Museum. For more things to do, photos, where to stay, and other tourist information, you can read our Helsinki route maker app . If you are flying in from Singapore, the closest major airport is Helsinki Vantaa Airport. In May, plan for daily highs up to 18°C, and evening lows to 7°C. Finish up your sightseeing early on the 7th (Tue) so you can travel back home.